As the backbone of plains tribes in America and the main vehicles on battlefields, it’s safe to say that horses have played an important role in human history. In fact, our relationship with them is an ancient one: the vestiges of their importance can even be found in our modern day language, when cars are described in terms of their ‘horsepower.’ Below, we’ve put together a horse tattoo dictionary, explaining the meaning behind several classic horse tattoo designs. Read on, and let your imagination run wild! Celtic Horse: the Celts held horses on a pedestal, believing that they were sacred animals associated with the sun god. Epona, the Celtic god of fertility, was responsible for protecting horses, as they were highly valued animals in this period. Flaming Horse: linked with the natural element fire, the flaming horse tattoo design is a symbol of wild strength and free-will. Horseshoe: the Europeans see an upturned horseshoe as a symbol of good luck, whereas the southern countries see a downturned horseshoe as a symbol of good luck. Either way, this tattoo design indicates a desire for a positive change in fortune. Race Horse: known for their speed, agility, and beauty, the race horse tattoo design symbolizes success and elegance. 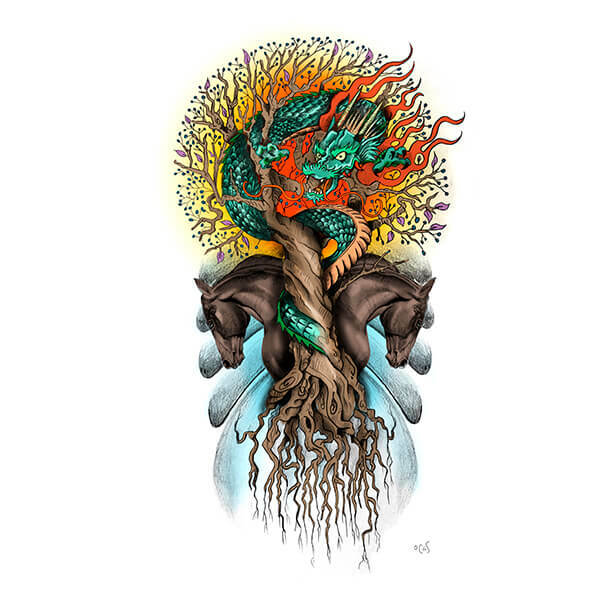 Tribal Horse: with Native American and South American influences, the tribal horse tattoo design represents a connection to one’s spirituality and symbolizes power and strength. Winged Horse: based on Pegasus, Zeus’ messenger, the winged horse tattoo design represents freedom of thought and creativity. Mankind has had a special connection to horses since ancient times, and today the relationship is still alive. As tattoo designs, horses can represent anything from good luck and beauty, to power and strength, making them an excellent choice. If you know of any other interesting horse tattoo designs, let us know about them in the comment section below! Will That New Tattoo Screw Up Your Career?